Inputs: span, beam size, lumber type and option of point load or uniformly distributed load (only simple beam spans included). 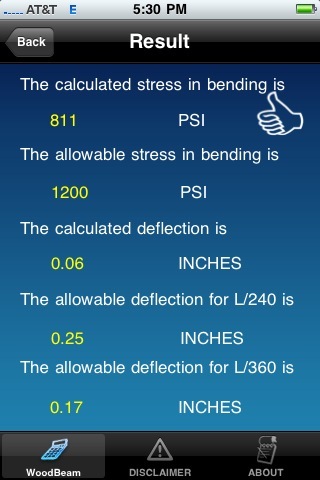 Outputs: calculated stress in bending, the allowable stress of your beam type and the calculated and allowed deflection. Results can be emailed, texted or copied to the phone’s clipboard. Feel free to email us with feature suggestions or new app ideas. You have a wood 6 x 6 spanning the top of scaffolding and a come-along lifting from it. You want to make sure the wood beam is more than adequate for the load you are hoisting. 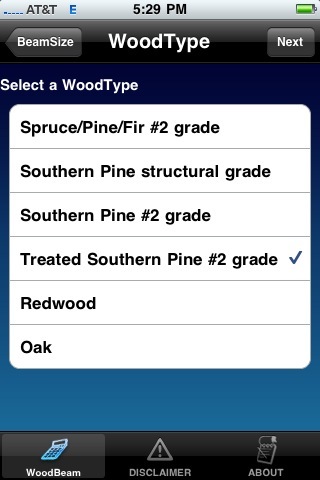 You know it’s treated yellow pine, spans 5’ and is trying to lift a 1,500 pound load (10 cubic feet of concrete). Wouldn’t it be nice to know if the calculation supports what your gut tells you? 2. 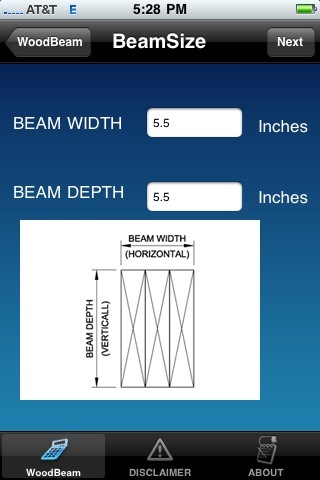 Input the proposed beam width and depth: 5.5" and 5.5"
4. 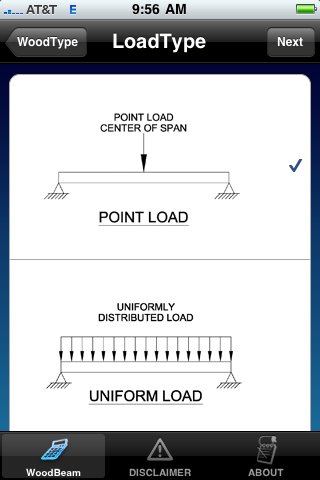 Indicate if the load will be a center of span point load or a uniformly distributed load? Point load. An example of a point load is a post bearing on a beam or a steel cable lifting a bucket with a come along. Point loads are in pounds. In the example on the screens, a bucket with 10 cubic feet of concrete is to be lifted. Therefore, the load will be 10 cf of concrete x 150 pounds/cf of concrete = 1,500 pounds. A uniformly distributed load, on the other hand, occurs when the forces acting on the beam are spread along the length of the beam. For example, a wood joist at 16" on center has 16" of plywood and carpet (say 2 pounds per square foot) of dead load above it. So the dead load becomes 2 pounds/sf x 1.33ft = 2.66 pounds per linear foot. The live load (say 40 psf for residential) would similarly be 40 pounds/sf x 1.33 ft = 53.2 pounds per linear foot. 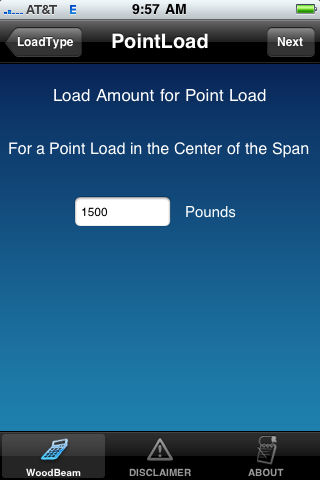 So the total load would be the dead load of 2.66 pounds/lf + the live load of 53.2 pounds/lf = 55.86 pounds/lf. 6. Verify that the top chord of the beam is restrained from twisting or buckling. The program considers only bending stresses for a simple span with either a center point load or a uniformly distributed load. The program assumes the top chord of the beam is adequately supported (either with regularly spaced joists or some type of stabilization ties) at least every five feet. If the top chord of the beam is not adequately supported, please understand the beam can fail from top chord buckling. 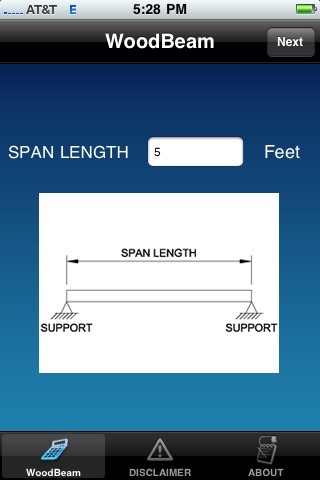 This program does not evaluate beam spans with unrestrained top cords. This basic wood beam design program should be used only by qualified persons. The assumptions and formulas in the program should be thoroughly understood by anyone using this program.